The sellers then displayed the same skills as this child. They are versatile and amazing. They are also supported by their families. There are dozens of other children who are just as versatile, but did not get captured on camera. Fifteen languages? I’m sure a survey could find other kids who know ten, eleven languages conversationally – they all swap knowledge. No child gets all the way into the most famous tourist attraction in the country – Angkor Archaeological Park – without an adult 1) driving them and 2) stocking them up with tourist items to sell. Child vendors are generally supported by an extended family that buys/resupplies their items to sell, provides transport, and replaces them with another child when they get too old and are not ‘cute’. Frequently these kids go to school. Some may duck out because temple selling is more profitable, it’s true. But just because they’re barefoot doesn’t mean they are destitute. The temples are a highly regulated area and only those who have paid fees/bribes get permitted/selected sell their wares there. If the spaces were truly open to all, tourists would be mobbed by beggars. On social media, there’s been a lot of attention and hand wringing. (“Please help him, save him”) There are also ethical considerations regarding filming any child so young. I’m not sure that’s good for these youths in the big picture. The tourist who made the viral video? She did not ask for the child’s approval before sharing his picture to the world. This young vendor is doing way better than lots of other children in Siem Reap, one of Cambodia’s poorest provinces. If there are any positive results from all the media attention, it would be great to see his family get long-term support to take the burden off him specifically at such a young age. 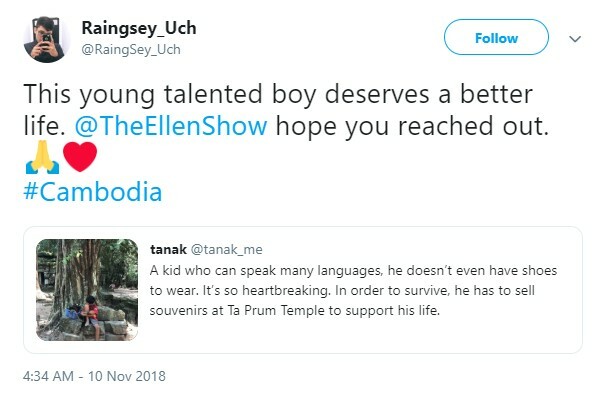 I doubt international media will understand that temple selling is a job and role that will never go away. In the broader picture? It would be smart to see authorities check to make sure child temple sellers go to school. It’s a half-day in Cambodia. Postscript: Article added November 17th. The vendor is going to school, has a family, and is pretty clearly not destitute. Fame can be a burden, let’s see how it works out. Now, the life of this simple family has been transformed. They have been brought on expense-paid trips to be guests on local television programmes in the capital Phnom Penh. Wealthy businessmen and charities have pledged thousands of dollars, donated new bicycles and toys, and promised to support Salik’s education until he finishes university. There is talk of the family being invited to visit Hong Kong. … while this family has been the fortunate beneficiaries of the country’s affection and attention, they are just one among hundreds around the Angkor area. And right across Cambodia, children are used as tools to supplement family incomes, often at the expense of their education. While Salik attends school each weekday, he also works several hours every afternoon. Post-Postscript: Holy cow! This child’s family is $50,000 in debt. That’s more than many farming families earn in a lifetime. Cambodia has a huge consumer debt problem: lenders give loans too easily and citizens are poorly informed of the risks. As an example: Cambodia’s total household debt stood at US$2.9 billion in April 2018 (National Bank of Cambodia), while a decade ago, debt was $200 million. This is the underside of Cambodia’s rapid economic growth – the tide is not lifting all boats, nor ‘trickling down’. Statistically, the broad majority of Cambodians are poorer. “We bought a plot of land and built a house, but it became more and more difficult to make enough money. I have weeks where I don’t earn a single dollar, yet I still have to pay the authorities US$5 a month to be allowed to sell souvenirs near the temple,” she says. Mann says the family has racked up debts of US$50,000, making it impossible to send her boys to a private school so they can improve their language skills. “At some point we had to borrow money from a private lender, but the interest was very high [15 per cent to 20 per cent].” Medical bills for her ailing mother and the expense of sending her to Thailand for treatment got them into a deeper hole. “Right now I still owe private lenders US$30,000 and the bank over US$20,000. The bank now wants me to pay US$700 a month. If I don’t pay it back on time, they will add the interest that I still owe them to the loan. I don’t want that to happen,” she says.